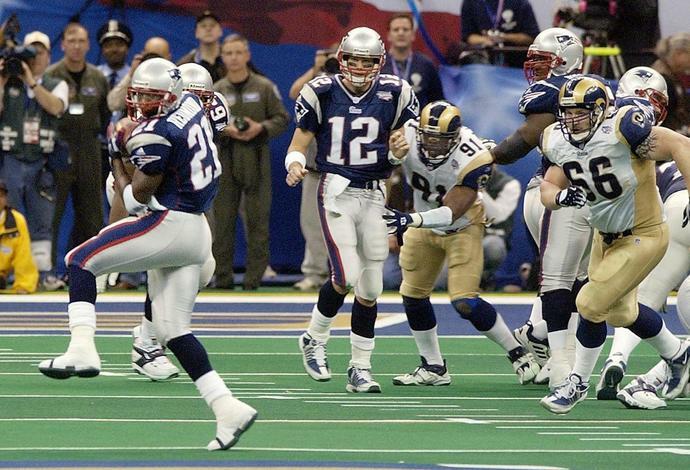 The New England Patriots beat the St. Louis Rams in Super Bowl XXXVI for one of the greatest upsets in NFL championship history, and one legendary Rams player is hoping for a rematch in February. Former Los Angeles Rams running back and Pro Football Hall of Famer Eric Dickerson was on FOX Sports 1's "Undisputed" on Monday and made his wish for a Super Bowl rematch known. The reason he wants to see this matchup, though, is sure to rile up Patriots fans. "I'll say this to all the Boston fans, as I watch them on social media: We want a rematch in L.A.," Dickerson said. "We want them back again, because they cheated us. They know they cheated us back in New Orleans. They watched our film. We want some more of them." There has never been any proof that the Patriots watched film of the Rams before Super Bowl XXXVI. Dickerson, like many other Rams fans, is looking for a convenient excuse for why the offense known as the "Greatest Show on Turf" was outplayed by such a huge underdog. For a rematch to happen in Super Bowl LIII in Atlanta, the Patriots must beat the Kansas City Chiefs on the road in the AFC Championship Game and the Rams need to defeat the New Orleans Saints on the road in the NFC Championship Game. A road team hasn't won a conference championship game in either conference since the 2012 season, so both the Patriots and Rams won't have history on their side Sunday. Still, it would be a lot of fun to see the Patriots battle the Rams in another Super Bowl, and it certainly would raise the stakes in the Boston vs. Los Angeles rivalry. If it happens, however, New England fans will be hoping it goes better than last season's Super Bowl XXXIX rematch against the Philadelphia Eagles. Tedy Bruschi admits Boston Marathon medal 'right up there' with Super Bowl ring originally appeared on nbcsportsboston.com Tedy Bruschi had a phenomenal NFL career with the New England Patriots that included three Super Bowl championships, but finishing the Boston Marathon for the third time Monday might rank just as high on his list of accomplishments. Bruschi himself even compared his Super Bowl rings to his 2019 Boston Marathon medal after finishing Monday's race. Here's some footage of the 45-year-old Bruschi running the rain-soaked course. Kobe on Kuzma, Ingram, Ball: "Are the three of them better than Anthony Davis? No!"